Spicy Poet herself came out and posed beside the photograph! 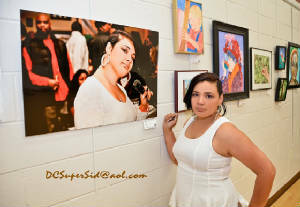 My photograph of local spoken-word poet Linda "Spicy Poet" Elliott was included in the Hyattsville Community Arts Alliance "Women's Intuition" exhibition. The show was a celebration of talented and accomplished women. 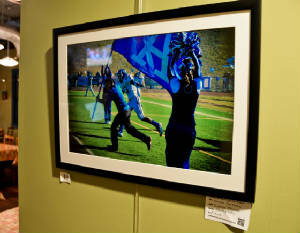 Fall 2014 brought the annual Hyattsville Arts "Autumn" exhibition. I entered by photograph entitled "Azure Autumn". The image represents the annual fall ritual of high school football.